Smart-watches more Distracting than Smartphones? 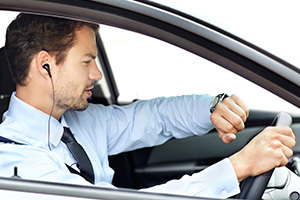 Smartwatches & Driving: A Bad Mix? There’s nothing illegal about looking at your watch to see what time it is but is driving with a smartwatch safe? As the gadgets continue to grow in popularity, there’s growing concern the technology is just another distraction behind the wheel. The aftermath of a distracted driving accident involves a lot of stress, especially if you were seriously injured in the crash. Let us put our team of reputable car accident attorneys in Tulsa, independent investigators and medical experts to work on your case immediately. Its not such a far-fetched claim to think smartwatches could make distracted driving worse, when you consider that mobile phones are involved in 27 percent of all U.S. traffic accidents. The new technology also presents another conundrum, how will it be legally enforced? How will police be able to tell the difference between a driver distracted by their smart-watch and a driver simply checking the time? Driving a vehicle involves the coordination of your vision and your reflexes. By taking your eyes or mind off the road or taking your hands off the wheel for even a second, your chances of being involved in a serious car accident increase significantly. According to Distraction.gov, in 2013, over three thousand people were killed in motor vehicle crashes involv­ing distracted drivers. This represents a 6.7 percent decrease in the number of fatalities recorded in 2012. Having won over $100 MILLION in successful verdicts and settlements(http://www.edwardslawok.com/verdicts-and-settlements.html) for our clients, the accomplished personal injury attorneys at The Edwards Law Firm have the determination and desire to fight for your MAXIMUM compensation in a court of law. With decades of combined legal experience we are proud to work on a contingency fee basis, meaning we don’t get paid unless you win.